It turns out that this is a better sale than I had originally thought. All year manufacturers have sent brochures and emails saying that the price of cotton is going up and that increase will be reflected in the cotton products that I purchase. Today I placed an order for more napkins and realized how true those warnings are. The napkin prices have not only doubled, but I am now required to purchase a minimum. Gone are the days of the $2 cloth napkins. After the above napkins are gone, the nice 20" x 20" cloth napkins with hemmed edges will be $4 each, before embroidery. This is true as to all cotton items, including t-shirts, towels, etc. Another thing to remember about cotton products is that "Egyptian cotton" is not always the best. The articles that I have read state that certain places in Egypt grow and sell exceptional cotton. Other places in Egypt grow and sell less than desirable cotton. Both can honestly claim to be Egyptian cotton. However, the United States grows cotton equal to the good Egyptian cotton, it is called PIMA. When buying cotton items, check to see if PIMA cotton is used to assure you are receiving a good quality. Don’t forget to visit our blog at www.cajunstitchery.blogspot.com, catalog at www.companycasuals.com/cajunstitchery and www.cajunstitchery.etsy.com often. We are also on Twitter and Facebook. Hope all of the dads out there had a wonderful Father’s Day. Next holiday is going to be the 4th of July. We’re back to the red, white and blue and there are several patriotic items in our Etsy store. Drop by for a visit. I was pleased to find out this week that Paradise Bar & Grill is listed in the top 10 bars in Florida. A hardy congratulation goes to Fred and Rene and the gang! The official ceremony is going to be this Sunday. I think it’s at 4:00 but you better double check. Fred is asking everyone to please attend to congratulate Rene and staff. I may have mentioned this before but I read an article not long ago about dog collars. The article said that it is very important that your cats and dogs have collars with their names and telephone numbers. This is true especially for disaster purposes. The aftermath of Hurricane Katrina was devastating on pets and their owners. Most were never reunited. My cats do not have collars because they are strictly indoor cats. They have had their front claws removed. After reading that article, I plan on making collars for the cats today and will embroider their name and my phone number on the collars. You don’t know what is going to happen at any given time. Another point is that even if your animal has an identification chip embedded, most people don’t think to take the cute little animal to the vet to check for ID. Nothing against ID chips; they are valuable. Also, if a pet finds itself misplaced, it is probably quite stressed. To see the animal’s name and be able to call him/her by name would be comforting and calming to the pet. Needless to say this article touched my heart. So, this week Cajun Stitchery has purchased the necessary items to make pet collars. Our very first commercial collar was made this week for Daisy. Miss Daisy’s collar was picked up today. I urge everyone with cats and/or dogs to please get identification collars whether from Cajun Stitchery or elsewhere. We feed our pets healthy, nutritious food. We take them to the veterinarian. We train them. We care for them. We love them. Please also keep them safe with identification. About last November, I received a call from a lady saying that she had an advertising company out of her home where she did advertising on local restaurant menus. The deal was that she provided the restaurant with free menus paid for by the companies advertising on the menu. For the advertising companies, we would get our business card size advertisement on a menu in a popular restaurant for 12 months at a very reasonable cost. In addition, once you lock into a particular cost for advertisement in one menu, you could advertise on any menu that she does for the same amount whether it is today, tomorrow or in 10 years, you would have the same rate. It seemed like a great deal that I could afford with a very small business. In addition, the restaurant would be Native Café on the beach, which has a special place in my heart. I agreed. The lady, in fact it was two ladies, came to my home and showed me the proof for my ad. We discussed changes and ideas. The menu was to come out in January. It was November at the time. I paid her. I signed her paperwork. And I counted the days to see our ad at Native Café. When January arrived, George and I went to Native Café for breakfast and there were no ads on the menu at all. I inquired about the ad with our waitress and she told me that the new menu would be coming out shortly. I called the advertising lady when I got home and she explained that there was a delay and the menus would be out in a couple of weeks. I finally made it back to Native Café last month. Still no ad. The owner came out and told me that there are lots of angry advertisers and he is not happy, either. The lady, who appeared so professional to me, never came through with the menus. In fact, she cashed the checks and no one can find her. She put everyone off long enough so that the bank cannot do anything about the checks. It is really a very sad situation because the idea is brilliant. It is a win-win situation for everyone involved. Haven’t we all seen menus like this with the advertising? Well, I learned my lesson. People like this make reputable companies look bad. There are reputable companies out there because we have all seen this type of menu. I say this because a friend of mine has a company, Menu-tizing, that does exactly this. She is reputable but I didn’t know about her last November. In fact, Cajun Stitchery will be embroidering her companny shirts soon. Speaking of shirts for Menu-tizing, our new digitizer is digitizing the embroidery design for Menu-tizing today. This digitizing company has won many awards for their digitizing and I’m looking forward to seeing their work up close and personal. I think this will become a really nice relationship. They told me that all of their digitizing is $30 per design. Of course, lettering and words, unless they are a logo or something that requires digitizing, can be done in-house without a digitizing charge. Same is true for stock designs. Since I have to pay the digitizer upon receipt of the digitizing, the $30 digitizing fee will be required up front. I’m selling these (in-stock) napkins at $2 each; first come, first served. The market baskets are just adorable and very functional. I have one for myself with the Cajun Stitchery logo embroidered. These market baskets are canvas and really nice. Perhaps it’s because no one else seems to be using market baskets for advertising purposes, but people really do stop to look at them. They have stopped me. Right now, in stock, we have black, red, purple, navy blue, hot pink, and black with white polka dots. These are all regular size market baskets and the price, without embroidery, ranges from $22 (for solid colors) to $28 (polka dot), each. A name or initials would be $5. Of course, the more embroidery you want on the basket, the more the cost. I think the purple would be great for Mardi Gras Krewes. Krewes are always lugging around stuff from food, to costumes, to items to create a float. 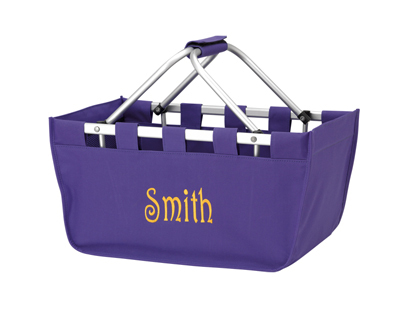 Put your krewe logo on the side of a purple market basket. We also have a black laptop case($24), a black with white polka dot carryall($14), some blue and white striped canvas purses ($8 each), hot pink purses($8 each), hot pink mini purses($6 each), and a brown purse($8 each). I’ll embroider a monogram (name or initials) for $5.00. The market baskets have a bunch of uses. 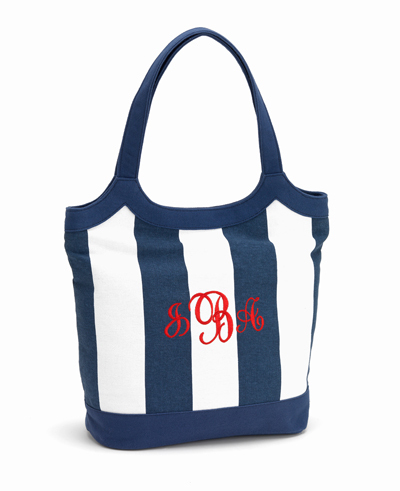 • One customer said they are perfect for a beach tote. • They make great personalized gifts or gift baskets. • With your logo embroidered, they are a wonderful advertising tool. 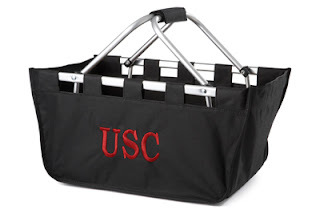 If you are like me and always seem to carry a bag with my wares, picking up or delivering items, your logo embroidered on the basket is ideal and unique. It’s an eye catcher. 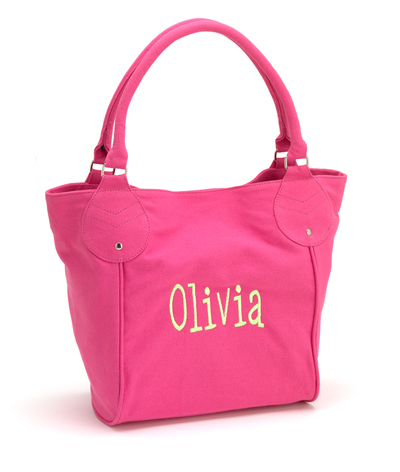 • Recent embroidery on a market tote was done by embroidering the outline of the word “Mine” and then filling the word with rhinestones. It turned out beautifully. The same technique can be used for any word. • They also make great picnic baskets. Include a set of matching cloth napkins, a tablecloth, some personalized can wraps, and an assortment of picnic items and you have a great gift. These totes have two mesh pockets on either end on the inside of the basket, as well as plastic feet and a luggage grip. A red market basket with blue or white embroidery, filled with red, white and blue napkins, tablecloth, can wraps, and other picnic items for your 4th of July picnic would be very patriotic. • Another really great idea is a wedding gift with the names of the bride and groom and the date of the wedding embroidered on the basket. Fill it with household items, linens, or picnic items. 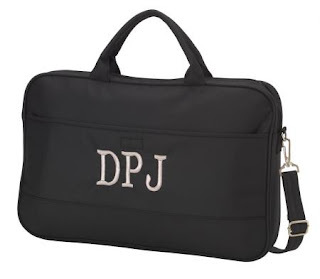 • And don’t forget that this makes a great diaper bag for mom. Embroider the baby’s name on the side. Fill it with diapers, blankets, bottles, and an assortment of baby items. Pink for girls; blue for boys. In fact, today someone came to me at the WBL meeting saying that she thought I brought a baby. • Fill it with your cleaning items and take it from room to room as you clean the house. • Same with gardening items. Don’t forget to include a pretty little apron. • The possibilities are endless. The 4th of July is next weekend. We now have the red, white and blue stripe, and the blue, white and red stripe webbing, 1.25” wide. There are more rhinestone flag buckles. If you are interested in a pretty terrific gift or patriotic attire for the 4th of July, George will make the patriotic belt for $10 each. Just let us know the waist size. About 6 inches are added to the waist size for proper adjustment of the belt. I can’t believe that no one won last week’s contest. My very first job in Pensacola was my job for 14/15 years. I worked at the Levin Papantonio law firm as a paralegal. The Louisiana State Police had received numerous reports of illegal cockfights being held in the area around Abbeville and had sent their famous Detective Boudreaux from Thibodeaux to investigate. "Dey is tree main groups involve in dis rooster Fightin", he began. "Good work! Who are they?" the Commander asked. Puzzled, the Commander asked, "Now Boudreaux, how did you find all that out > in one night?" "And how did you figure the Mafia was involved?" "De duck won." We received an order for a dog collar today. Daisy is one cute little dog and her owner is a real nice guy, too. A few weeks back when we took our dogs to the vet for their annual visit, I made Stinky a collar from white webbing with her name embroidered in blue. It really looks nice. I decided to sell the dog collars at that time. The dog collars have been on my mind for awhile. Out of all of the webbing that I have purchased, Daisy needs a smaller size, 3/4". I have 1", 1.25", even 2" but Daisy needs 3/4". That's okay. I decided to place the order for Daisy's collar but also for the collar pieces that I am missing with the rest of the webbing, such as clasps, dee rings, and various hardware. You see, originally I purchased the 2 bolts of 1" white webbing. I was going to use that making totes and purses. In fact, I did use it for totes and purses but 2 bolts goes a long way. The 1.25" webbing is the red, white and blue; and the blue, white and red webbing used for George's belt. There's a bolt of each. I don't even remember why I bought the 2 inch black webbing. I had also purchased, sometime ago, 5/8" clasps and some other hardware. Originally, the clasps and hardware were because I wanted to make bowties and I couldn't find the proper hooks. The clasps work but they aren't the right thing and a bowtie requires specifics. Although I must say that I have now seen bowties with the little clasps. Then I was going to use them on cell phone pouches. I did use them for a few of the cell phone pouches. I read an article on a dog website sometime ago that every dog and cat needs to have a collar with their name and telephone number on it. The article was actually about all of the lost and misplaced pets from various disasters, such as Hurricane Katrina. Without a name and phone number, it's not likely the pet will ever find its owner or vice versa. I can embroider names and telephone numbers. It is also a good cause. I'm almost positive my animals will never get lost. The cats are strictly inside cats -- no front claws. The dogs are inside, or if outside, they are in a fenced yard. But, I lived through Hurricane Ivan. You never know. Do you want to take the chance? I've been thinking about this and the first thing I'm going to do when my shipment arrives is make collars for all of my animals. In fact, I'm going to make Stinky a new collar and include our telephone number. An alternative to a collar with the name and telephone number is an implanted chip. George pointed out to me that if a person finds an animal with an implanted chip, how are they going to know? How would you know the animal's name to call it and make it feel comfortable? Not only that but how many times do people find stray animals without identification to call the owner and end up keeping the animal for themselves, never thinking to ask a vet to check for an ID chip. We love our pets. In many instances our pets take the place of our children, or become another child in the family. Many people who live alone have a pet as their sole companion. We feed them nutritious meals. We provide a shelter for them and a comfortable living environment. We take care of their health. Shouldn't we also take care of their safety? I do urge everyone to make sure your pet, even if it is an inside pet, has recognizable identification in case something unexpected happens. Whether you purchase the collar from me or elsewhere doesn't matter. The safety of your pet is what matters. The Fiesta Ball is now a thing of the past and we must move onto the next event. Before we leave the Fiesta topic, let me suggest that everyone go to www.PensacolaBeachMardiGras.com and look at the photographs of the evening. I love our group picture. I am the short woman, of course. The next event would be Father’s Day, which is this Sunday, June 19th. What does everyone do for Father’s Day? Both of my dad’s have passed away. I did put some items, recommended by George, in the Etsy shop specifically for men. Just wondering what everyone else does? We used to buy little gifts for Johnny but there really wasn’t much more. Last Saturday I reluctantly went to my friend and hair dresser’s open house for her hair salon. She’s asked me before to bring my wares to her open house and I have declined. This time I decided to attend. I sure am glad that I did. She’s had her salon for, I guess, about a year and has done a remarkable job. The salon, All About Me, is lovely. There were other “artists” there, as well. One lady was selling her oil paintings, another sold jewelry, and another was a photographer. Out came the market baskets, purses and other items which filled the top of a counter. Then I sat. If for no other reason, it was worth it to meet these ladies. Several women began talking about makeup and before I knew it, they were applying makeup to each other. I learned some great tips on disguising wrsinkles and double chins. A couple of the girls from the krewe showed up which put me at ease. At least I knew someone. I met the other hair dressers there and they even had live music performed by a local musician, Paul Killough. When the door prizes were announced, I won a hair color treatment. Both of my krewe friends each won a prize, as well. In fact, all three of us made appointments for yesterday. Two of us showed but one had to cancel for health reasons. Would I do this, again? Absolutely, I would. I do need to learn how to set up and present my items better but that comes with practice, I’m sure. I did have a few sales and simply enjoyed the evening tremendously. Wednesday night is always our girls’ night out. This Wednesday we began gathering at The Break for COLORS (Celebration Of Life Of the Republic of Sandspur). Everyone is invited to COLORS on the 15th of each month at a location that changes each time but is always on the beach. Once a month all of the old timers, characters and others gather to exchange beach stories and find out all of the local news and gossip. Even our Shelley, from the Island Times, is there. After COLORS we went to Paradise Bar & Grill for dinner and drinks. We had a lovely time. Not only were many of our krewe members in attendance, but also many of the people from COLORS joined us. It was definitely a fun evening with good friends, good food (Rene is the best), good drink, and great entertainment. After Paradise, several of the girls went home and several more went to Paulette’s to continue our Wednesday night festivities. We laughed until my face hurt but that is so typical of our Wednesday night girls’ night. With my new do and my hair dresser with me, I attended the Gulf Breeze WBL (Women’s Business Luncheon) meeting today. The Gulf Breeze WBL meeting has been around since the month that Cajun Stitchery opened its doors in March, 2009. Recently attendance had dwindled. It was so good to see that attendance was up today. These wonderful women have become my friends and they really are a wonderful group. So, I was happy that Cathy, my hair dresser and friend, joined me today. As I write this, my white flashing boa is still slung over the banister. The red, white and blue tinsel wig, flashing tiara, and red, white and blue flashing light sticks are decorating the center of my kitchen table. Guess I’ll leave it all as is for the 4th of July. 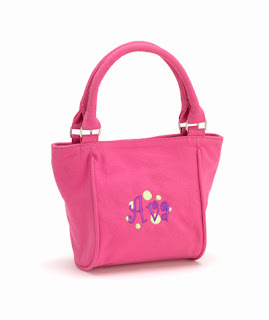 I’m sold out of the little hot pink, mini market totes. Of course, I can get more. One of the regular size market baskets was sold at the open house. These baskets are just adorable and very functional. I have one for myself with the Cajun Stitchery logo embroidered. Since I carry so much stuff around with me, I even put my purse in the basket. These market baskets are canvas and really nice. Perhaps it’s because no one else seems to be using market baskets for advertising purposes, but people really do stop to look at them. They have stopped me. From the same shipment, we also have a black laptop case($24), a black with white polka dot carryall($14), some blue and white striped canvas purses ($8 each), hot pink purses($8 each), hot pink mini purses($6 each), and a brown purse($8 each). 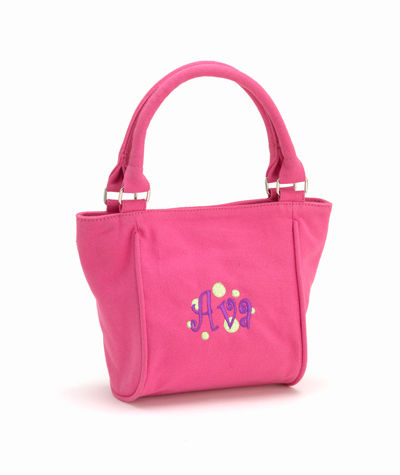 I’ll embroider a monogram (name or initials) for $5.00. We now have the red, white and blue stripe, and the blue, white and red stripe webbing, 1.25” wide. There are more rhinestone flag buckles. If you are interested in a pretty terrific Father’s Day gift or for the 4th of July, George will make the patriotic belt for $10 each. Just let us know the waist size. About 6 inches are added to the waist size for proper adjustment of the belt. Better hurry if you want it for Father’s Day because Father’s Day is on June 19th. SALE: Good through next Thursday, June 23rd. 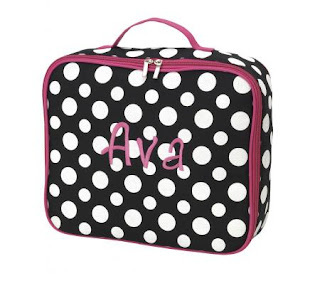 Adjustable can wrap with your name or initials embroidered in outline with rhinestones for $7 each. The rhinestones are applied by hand and usually sell for at least $10 (depending on how many rhinestones are applied). Never lose your drink again. The year is 2016 and the United States has just elected the first woman, a Louisiana State University graduate, as President of the United States, Susan Boudreaux. Saturday I attended an open house at a friend's beauty salon. She told me to bring some of my stuff and set to sell. Obediently, I did as she suggested. It turned out that this was a wonderful evening. Yes, I sold some things and was able to show off the new market baskets, but I met new (and old) friends and simply had a lovely time. On top of a lovely evening, I won a door prize for my hair to be colored. Two of my friends also won similar door prizes and we scheduled appointments together on Thursday. That should be fun. I had purchased four of the hot pink, mini, market baskets. A customer had purchased three and ordered some embroidery. I bought an extra one, just in case. Well, that extra one was sold at the open house. Yesterday and today I worked on the mini hot pink orders and am now ready for delivery. They are adorable, don't you think? This week is when Wachovia and Wells Fargo merge. Today was when the accounts online were affected. Of course, nothing worked for us. We called customer service but were not able to get someone who understood what we wanted to do. Finally, George and I went to our bank. For the most part the banking was successful but more than that, the representative helping us began asking about embroidery and was looking into embroidery on hand fans, like Spanish fans. She attends ballroom dancing classes. It just goes to show that you can pick up customers wherever you go, even in the most unexpected places. I still haven't finished my bookkeeping today so I'll make this short. Before I go any further, someone named Mary emailed me this week and asked to be removed from this newsletter list. I tried every way that I know to figure out which Mary it was that wants to be removed. I could not find the last name, or even the email address. It just kept coming up as Mary. I replied to sender asking for her name so that I could remove her from the list but I have not received a reply. If you wish to be removed from the emailing list, please do let me know but please, please, let me know your name and email address. Mary, I apologize if your name has not been deleted. Please let me know which Mary you are – we have several on the list. As I made my costume for the Fiesta Ball, I posted photos and comments on the blog, as well as Facebook. I had no idea so many people were following this costume creation. As the very last touch to the costume, on Wednesday, I embroidered a little evening bag made from the fabric in my costume. The embroidery design was the Blue Angels with “100th Anniversary” and “Naval Aviation.” Wednesday evening arrived and, although I haven’t seen any really good pictures of George and me together, we made a really cute couple. Looking back, of course, I would have changed a few things but the costumes worked and we had a fabulous time. 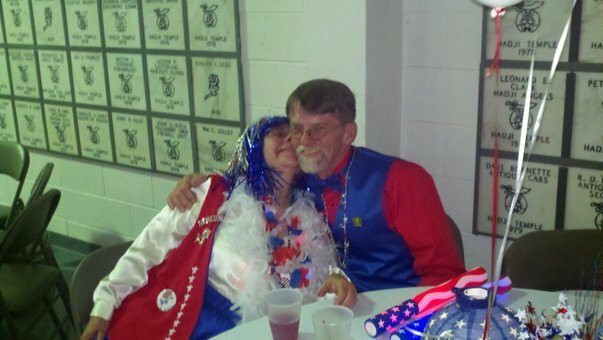 By the way, George made his own belt out of blue, white and red striped webbing and a rhinestone flag belt buckle. He looked great! As we arrived at the ball, we met our friends, Morrie, Kathi, Paulette, and Deb outside. Kathi brought the blinking items and I was completing the costume outside the front door. Yes, I adorned the red, white and blue tinsel wig with the blinking, plastic, red, silver and blue tiara. There were several necklaces placed around my neck. All were red, white and blue and blinking. Then we attached pins. Then came the white boa with the blinking lights. Except for the basic costume that I made, Kathi, Paulette and I were adorned the same. Well, Paulette didn’t wear the tinsel wig. Finally, we were all dressed and ready to make our entrance. This is an all krewe ball, so don’t think we were the only ones in costume. Oh, no. There were fabulous costumes from the Myoki Indians with all of their feathers to the very formal and elegant gowns and tuxedos. There were pirates and Alice in Wonderland costumes. Kings and Queens of all of the krewes were announced. It was quite a sight. Once we entered, we found the Krewe of Junkanoo table. You can’t miss the Krewe of Junkanoo because they are such a rowdy bunch. Besides they were one of the first tables. To our surprise the Mystic Krewe of Nereids had a table next to the Krewe of Junkanoos. It goes without saying that putting those 2 tables so close was the beginning of a rip roaring good time. We kept mentioning that some of our people were missing. Nevertheless, we got our drinks and more and more of our krewe arrived. My mother always taught me to mingle with crowds and this event was no different. During my mingling, I found our lost friends on the other end of the room. The Krewe of Wrecks (our mother krewe) was on the other end of the room. Some were disappointed that their table wasn’t with our table. Not me. Traveling back and forth between tables gave me the opportunity to meet people and have a good time. The band stopped and the various krewes performed their dances. They were all so good. People unfamiliar with Krewes usually don’t understand the effort and expense that goes into costumes, dances, floats, pins, beads, and a myriad of things. I think most Krewes, at least around here, meet monthly, all year round. There’s a lot of work involved. While watching performances and mingling, a nice couple asked to take my picture. I obliged; then headed for our krewe table. Shortly, afterwards the same gentleman approached me and said, “Please don’t leave. You are going to win for the best individual costume.” I asked his name and he said, “Glenn.” Sure enough, after announcing the winner of the krewe performances, I was announced as the winner for best individual costume. I wish I had been a bit more sober at the time so I could savor the moment. As luck would have it, I wasn’t. Did Glenn know what an honor that was for me? Out of all of the wonderful costumes in the room, I was singled out. Did Glenn watch me make this costume on the internet? So many people approached me at the ball saying that they watched as the costume was made. Well, Glenn, whoever you are, I thank you from the bottom of my heart. Finally, the evening came to a close. The memories of this wonderful Fiesta Ball will be with me forever. When George and I arrived home from the Ball, there was a huge box at our front door. The market baskets arrived from a new vendor. These market baskets are canvas and really nice. Right now, in stock, we have black, red, purple, navy blue, royal blue, hot pink, and black with white polka dots. 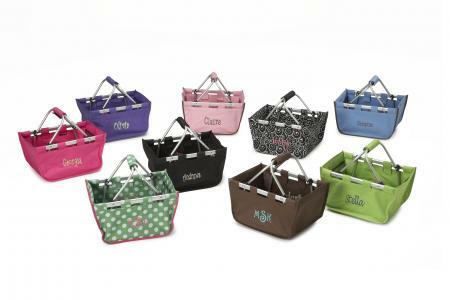 These are all regular size market baskets and the price, without embroidery, ranges from $22 to $28, each. We also have some hot pink mini market baskets for $14, each, without embroidery. There is a black laptop case($24), a black with white polka dot carryall($14), some blue and white striped canvas purses ($8 each), hot pink purses($8 each), hot pink mini purses($6 each), and a brown purse($8 each). 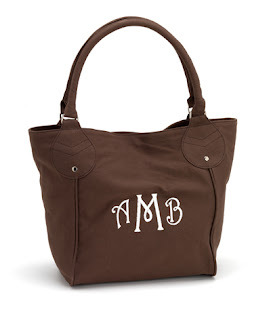 I’ll embroider a monogram (name or initials) for $5.00. • Recent embroidery on a market tote was done by embroidering the outline of the word “Mine” and then filling the word with rhinestones. It turned out beautifully. • And don’t forget that this makes a great diaper bag for mom. Embroider the baby’s name on the side. 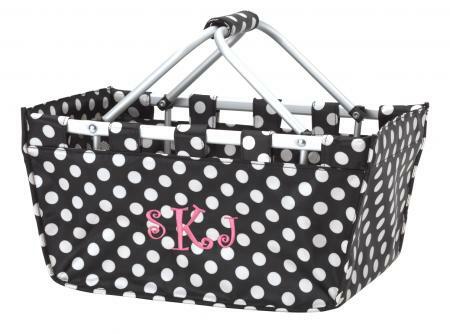 Fill it with diapers, blankets, bottles, and an assortment of baby items. Pink for girls; blue for boys. We now have the red, white and blue stripe, and the blue, white and red stripe webbing, 1.25” wide. There are more rhinestone flag buckles. If you are interested in a pretty terrific Father’s Day gift, George will make the patriotic belt for $10 each. Just let us know the waist size. About 6 inches are added to the waist size for proper adjustment of the belt. Better hurry because Father’s Day is on June 19th. SALE: Good through next Thursday, June 16th. 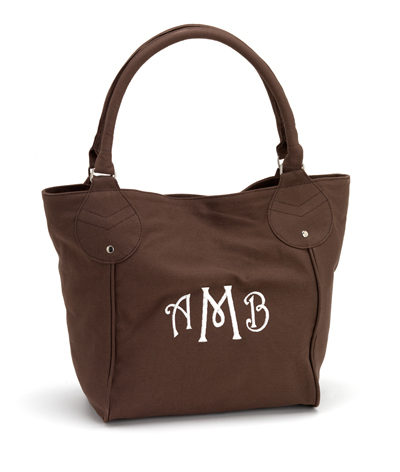 Adjustable can wrap with your name or initials embroidered for $5 each. They usually sell for $7 each or $5 each when purchasing 10 or more. Never lose your drink again. Boudreaux bought his wife Marie a piano for her birthday. A few weeks later, Fontenot inquired how she was doing with it. "Oh," said Boudreaux, "I persuaded her to switch to a clarinet." "How come?" asked Fontenot. "Well," Boudreaux answered, "because with a clarinet she can't sing." I finished the blue, floor length skirt with an elastic waistband. Elastic just so much more comfortable. Besides, I found I had some wide elastic which is really comfy. After the skirt, I cut out the red vest and decided to make it reversible with the blue fabric from the skirt. The vest pattern had to be altered a bit to fit me but it worked out fine. After cutting out the pattern, the edges were serged and the shoulder and side seams were sewn for both the red and blue fabric. Then, right side to right side, I sewed all around the vest and turned it inside out via the arm holes. I ironed the vest and pinned the arm holes. I decided to hand sew the arm holes, although sewing on the machine would have been fine. The costume was constructed. Ahhh, you may think that's it. Oh no. Next comes the embellishment. I decided white stars would be appropriate, especially since the bobbin thread is white. I embroidered a row of white stars on each side of the vest. Because the bobbin thread is also white, the stars also appear on the blue reversible side of the vest. Cool, huh? Then I decided I wanted stars on the skirt. Rather than a row of stars around the bottom of the skirt, I've decided a few rows of white stars up and down, like on the vest. Then I decided to sew a pearl in the center of each star. That's where I am now. This may be the end of it but we won't know until tomorrow. Yesterday, I also embroidered a market basket for a customer. She wanted the word "Mine" embroidered in a pretty script. I suggested that we do the word in an outline script and fill with rhinestones. She loves her market basket now. I need to get back to my pearl sewing.